Last week at this time I was looking at a tuxedo hanging on Cody’s bedroom door feeling nothing but excitement for his evening ahead at the Senior Ball. Not only did he look ridiculously handsome, but he also had an amazing time and danced all night long. It was the first big event of a weekend he had been looking forward to and talking about for the last nine months. Time really does fly by, especially when you want it to slow down just a little bit. The day after the ball Cody spent some time relaxing while I cleaned like crazy in preparation for his graduation and the party that followed afterward. It turns out that cleaning helps relieve nervousness and anxious feelings (at least a little bit). I mean, I had not doubt that Cody would do well throughout his graduation ceremony, but I always worry a little about the unknown. His teacher is pretty awesome, though, and she worked hard to prepare Cody for his big day as a member of the Class of 2015. Sunday arrived and we couldn’t have asked for a more beautiful graduation day. The sky was blue, the sun was shining, and the air was comfortably warm with the slightest breeze (just enough to keep the pesky flying bugs away). 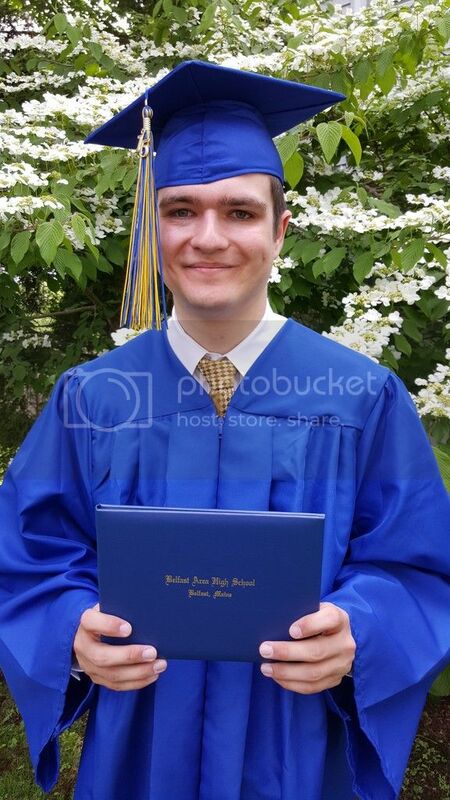 Cody was dressed in his cap and gown and eagerly ready to march with his class and walk across the stage in front of family and friends. I have to be honest. The last couple weeks have been a bit of a roller coaster ride for me. I’ve been either at a loss for words or overwhelmed with emotions so it’s a little difficult for me to express exactly how it felt to see my son blending in with his peers as he focused on staying perfectly instep with his marching partner on a day that he’s been looking forward to for so very long. Of course pride is the first feeling that comes to mind, but on that Sunday afternoon I was feeling so much more, not only for Cody but also for the loved ones who joined us on such a special day. Cody has worked hard to overcome so many challenges over the years due to his autism and I feel truly and sincerely lucky to be his mom. One of my biggest hopes is that those who have worked with him or met him throughout his school years feels just as lucky to have known him because he’s a pretty special young man, if I do say so myself. Congratulations, Cody and Happy Graduation! I love you a ridiculous amount.